The UK population is ageing. Ageing is a natural process involving physiological and biochemical changes that affect the whole of the body. The rate of decline in the body's functions as a result of ageing varies from person to person. Good nutrition contributes to the health of elderly people and their ability to maintain their independence, mobility and overall quality of life for longer. Ultimately, these factors may also lessen the burden of health costs. The food that is provided in hospitals and care homes can define the whole experience of the organisation for the patient (or service user). They may or may not be able to tell the difference between good or bad treatment, but can always tell if the food is good or bad. Food has a role quite apart from its primary function to privde the body with fuel and nutrients to stay alive. One of the objectives of this workbook is to facilitate the lone worker to engage in communication with colleagues as well as service users and their families, to ensure that nutrition is regarded as an integral part of care. This book has been written to heighten awareness of nutrition as care and encourage readers to take ownership of ensuring that good practice is implemented on a day to day basis. You will find that completing the exercises will improve your understanding of what nutriitional care means to your client group whether they are in hospital, residentail care or in their own home. 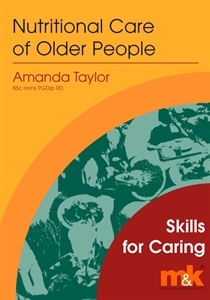 The Skills for Care Workbooks are self-directed study workbooks that will appeal to everyone with a health and social care interest. They can be used as stand-alone modules or part of an assessment, or as part of a more format training programme at a college or other institution. They have been designed to be very flexible.